Sauerkraut is finely shredded cabbage that has been fermented by various lactic acid bacteria, including Leuconostoc, Lactobacillus, and Pediococcus. 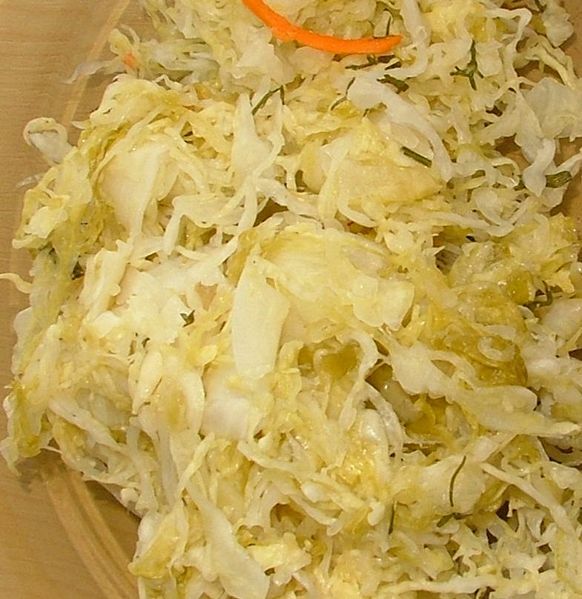 It has a long shelf-life and a distinctive sour flavor, both of which result from the lactic acid that forms when the bacteria ferment the sugars in the cabbage. It is therefore not to be confused with coleslaw, which receives its acidic taste from vinegar. Left: Polish Sauerkraut (Kiszona kapusta). The word comes directly from the German language, which literally translates to sour cabbage. Sauerkraut is traditional in German, Austrian, Croatian (kiseli kupus), Slovenian (kislo zelje), Slovak (kyslá kapusta), Polish (kiszona kapusta), Czech (kysané zelí), Dutch (zuurkool), Estonian (hapukapsas), Finnish (hapankaali), Latvian (skābi kāposti), Lithuanian (rauginti kopūstai), Danish and Norwegian (surkål), Romanian (varză murată), Serbian (кисели купус/kiseli kupus), Bulgarian (кисело зеле kiselo zele), Russian (квашеная капуста kvashenaya kapusta), Ukrainian, Hungarian (savanyú káposzta), and Belarusian cuisines. Finally, it is also popular in Northern Italy, Alsace Lorraine in North Eastern France, many parts of Northeast and Northern China, the USA, Chile (chucrut), and Canada. Sauerkraut is made by a process of pickling called lacto-fermentation that is analogous to how traditional (not heat-treated) pickled cucumbers are made. Fully-cured sauerkraut keeps for several months in an airtight container stored at or below 15°C (59°F). No special culture of lactic acid bacteria is needed because these bacteria already are present on raw cabbage. The fermentation process has three phases. In the first phase, anaerobic bacteria such as Klebsiella and Enterobacter lead the fermentation, and begin producing an acid environment that favours later bacteria. The second phase starts as the acid levels become too high for many bacteria, and Leuconostoc mesenteroides and other Leuconostoc spp. take dominance. In the third phase, various Lactobacillus species including L. brevis and L. plantarum ferment any remaining sugars, further lowering the pH. A study at King's College, London, found that "pickled cabbage", or sauerkraut, was an aphrodisiac as effective at increasing sexual function as the popular drug Viagra.